After unboxing your new mobile smartphone and being mesmerized by its glory, you’ll probably want to test its potential with the latest graphic-intensive games. Smartphones today are equipped with the best processors and graphics capabilities such that they can even be better than most hand-held gaming consoles. However, there are still a handful of gamers that are obsessed with 8-bit games despite this advancement in technology. 8-bit or pixel art games were initially used to display characters and levels in a manageable way for gaming consoles, arcades, and home computing titles of the 80s. Pixel art usage saw a rapid decline during the era of the launch of 3D-capable gaming consoles like the Sony PlayStation and Nintendo 64. They have since made a comeback, and many pixel-art titles have been released for Android and iPhone in recent years. Some games were inspired by the 80s dungeon crawlers, while others were pure addictive titles generously sprinkled with pixel dust. The extent of how pixel art is used now is different as it’s not retro, but it’s innovation, bringing new techniques and gaming style to modern gaming genres. 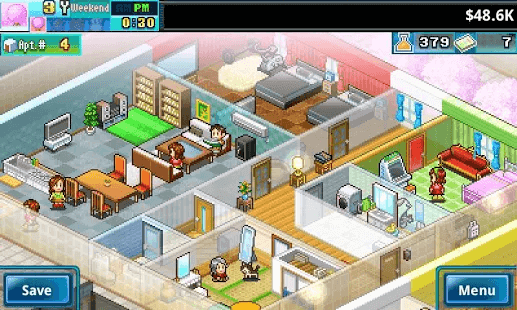 Founded in 1996, Japanese game developer Kairosoft (カイロソフト) are known for developing game titles with unique gameplay and distinctive pixelated art style. 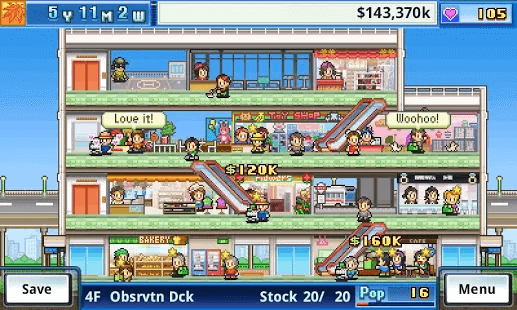 With the release of Game Dev Story on iOS and Android in 2010, Kairosoft became a large hit and reached the top ten in iPhone app sales during the first week. Since then, Kairosoft grew its roots in this niche market in the mobile gaming scene. 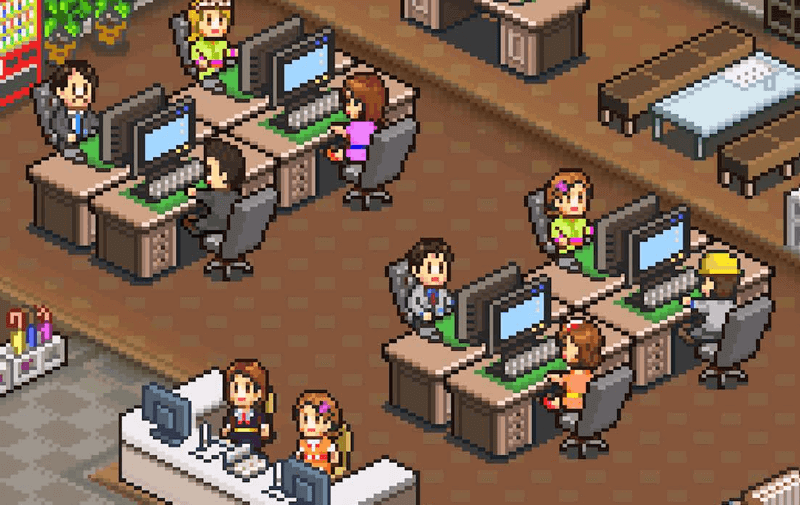 1) Game Dev Story (Last updated April 26, 2017): Game Dev Story is a simulation video game by Kairosoft that allows you to manage your game company with the goal of making hit titles and consoles in order to make money. It features the ability to manage the quality of games released by hiring staff, controlling the direction and speed of game development, and using items which provide additional boosts for workers or change their jobs. 2) Mega Mall Story (Last updated February 2, 2018): Mega Mall Story is a mall management simulation game that allows you to manage a small mall, which you can expand by adding new stores, building more floors, providing new modes of transportation, and making your customers happy. The aim of the game is to increase your establishment’s popularity to make money. 3) Anime Studio Story (Last updated November 10, 2016): Anime Studio Story is similar to the “Anime Studio Story” as a “Developer” style simulation game. In the game, you manage your own anime company to develop the best anime available in the market in an attempt to become the best anime company. Speaking of the company, you can equip it with a library or even a theater. You can also upgrade your staff to craft a classic that will echo through the generations. 4) Pool Slide Story (Last updated September 13, 2018): Pool Slide Story is a management game where you can create and manage a wonderful and dazzling water park. Expand your water park by adding exciting facilities to become the talk of the town. You’ll be spoiled for choice when comes to customizing your water park with a wide selection of attractions to build. 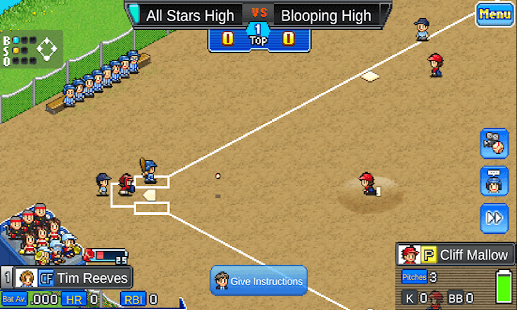 5) Home Run High (Last updated June 6, 2018): Home Run High is a management simulation game that places you in charge of a high school baseball team. It might be a small after-school club now, but with the right management, this team will climb to world-class standard. It features the ability to train your players, install batting cages and other facilities to make life better for the team. 6) The Ramen Sensei 2 (Last updated September 10, 2018): The Kairosoft’s Ramen Sensei 2 is a simulation game that allows you to start and manage your own ramen restaurant. In order to make the best ramen, you will need to create your own noodles and soup. New soups and noodles are unlocked as you progressed through the game. Win over customers at ramen festivals, which you can play together with friends and face off rivals at ramen arena contests and make your Ramen Hall prosper. 7) Dream Town Story (Last updated June 26, 2018): Town simulator games are a dime a dozen, and they all seem to follow the same cookie-cutter format. 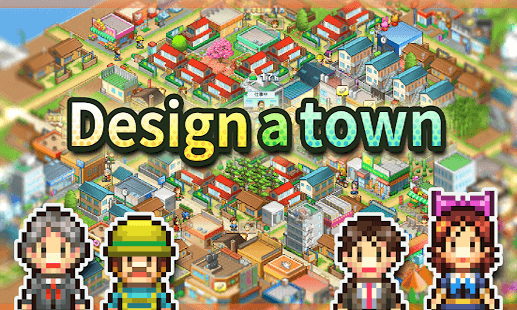 Dream Town Story is a town building simulation game that breaks the mold of the city-building genre by allowing you to build your town from scratch. You can build houses, shops, and lots of other facilitiesto make your town a vibrant, lovely place to live in. Once you settled into your town, you may also try co-op mode, which enables you to team up with other players to build towns together. 8) Dream House Days (Last updated June 5, 2018): Dream House Days is an apartment management simulation game, where you can furnish apartments, and slowly grow your property into a place anyone would be happy to live in. You play as both an architect and a landlord in this fanciful title, and it’s up to you to furnish your ideal apartment with anything from arcade games to saunas to convenience stores. As you rise up the rankings of real estate fame and you might reel in celebrity tenants, ranging from popular singers to soccer stars, making huge profits.